Update your details online quickly and easily by completing the relevant form below. This should be done if you have moved homes, changed your email address or would like to add another nominated person to your policy. Pay your bill online right here either yearly or through monthly instalments. If there is anything you are unsure of, check our policy FAQ’s to see if the answer lies here. 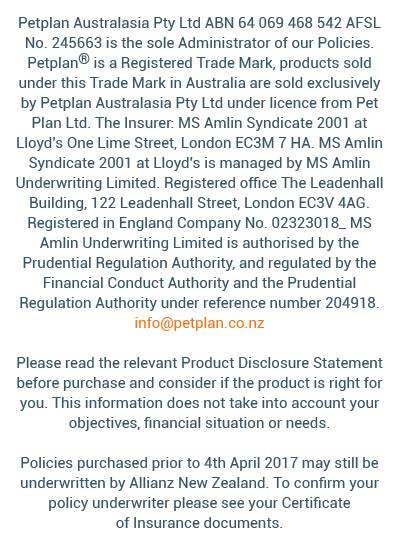 It is simple to activate your continuous policy right here if you already have a 4 or 6 weeks free insurance policy with Petplan. To activate your full year cover in a matter of minutes, just enter your policy number and state in the boxes below. Our 12 month essential plan and Covered for Life options are the two covers that Petplan offers. Simply download, print and fill out the claim form below to make a claim. If you need a hand with the claims procedure, please refer to our guide How to Make a Claim Form.